Mount Athos is situated in the eastern and most enchanting third peninsula of Halkidiki, which is called the peninsula of Athos. It is the only place in Greece, which is totally devoted to praying and worshiping God and thus, it is called the Holy Mount. The Holy Mount or the Mount Athos has about 50 Km length, 8 to 12 Km width and it covers a surface of about 350 square kilometers. The borders of the monasterial city are set on the ground by an imaginary line that begins from the location “Fragokastro” on the West coast and reaches the cape “Arapis” on the opposite side. The natural beauty of the peninsula is wonderful. 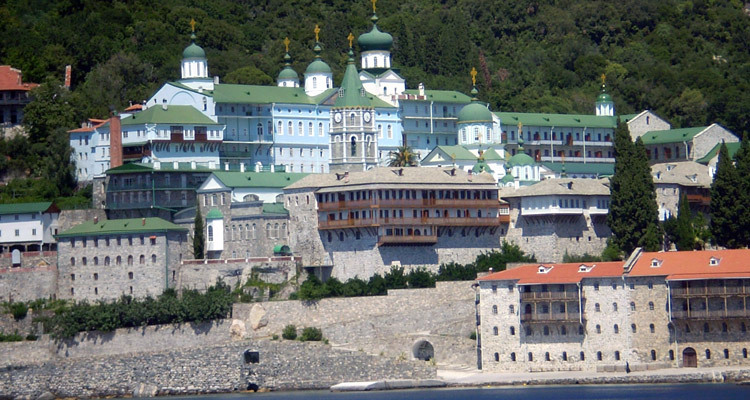 The Mount Athos that dominates there is an enormous cone of 2.033 meters height. It’s bare top that seems to be piercing the sky and its slopes, which are full of old evergreens, give the area a unique natural beauty.